We are delighted to announce that we will be holding 3 days of workshops in Mali later this month. 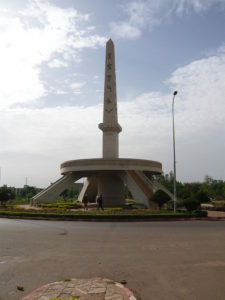 L’obélisque des idéogrammes, a monument in Hamdallaye, Bamako. Each side of the tower is inscribed with writing and symbols from Mali’s different ethnic groups, including N’Ko and Tifinagh, as a symbol of national unity. Locals call it the “bougieba” or the big candle. At long last, we have completed manuscripts of the book Where There Is No Doctor in both French and Bambara. These editions have been completely updated and adapted for West Africa. We’ve informally shared drafts with Malian experts over the years, but now it is time to get more detailed feedback from health workers and health volunteers to be sure the book is responsive to their needs. The workshops will be held in Bamako from August 29 to 31. We have planned one day for experts from government and NGOs. The two following days we will hold focus groups with health workers and others who are the “target audience” of the book. If you know someone in Mali who could help us by attending either workshop, please be in touch. We’re also learning how expensive it is to hold this kind of meeting in Bamako. Please consider making a donation to support this effort. Congratulations for your terrific work. The French and Bambara versions of the book can be used all over West Africa and particularly in Mali to promote health.